Yesterday we woke up before 6 AM so that we could get a photo of the sun rising above the Dome of the Rock. Unfortunately, it was too hazy to see the sun. 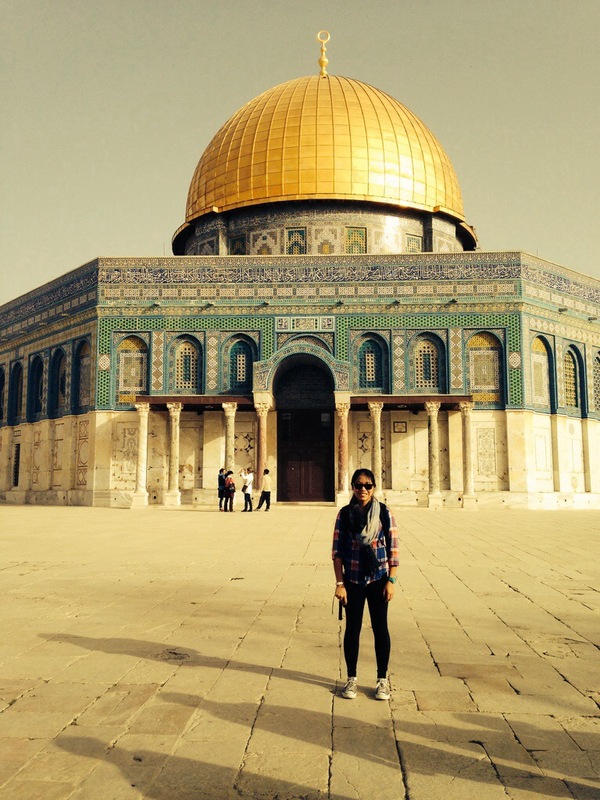 After breakfast at 6:30 we all headed to the Dome of the Rock to get there before the line was too line. 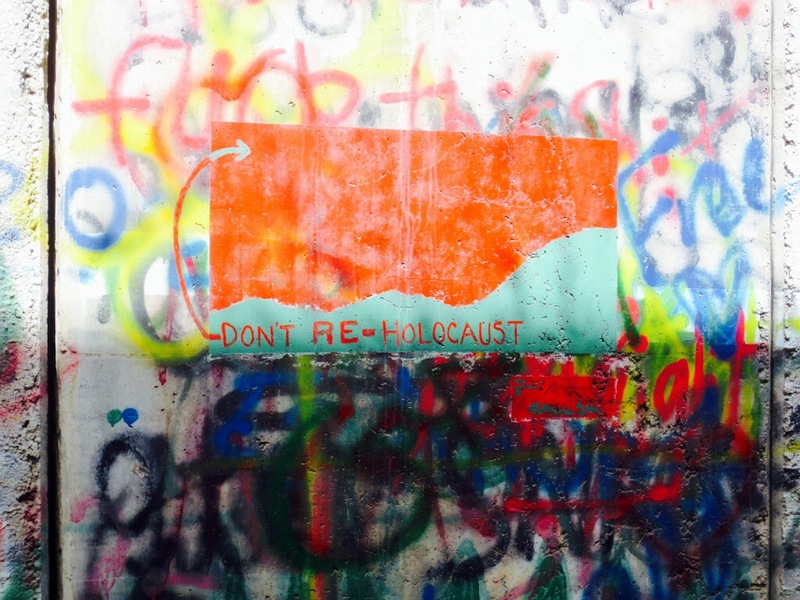 Later that morning we went to the Holocaust Museum and then drove to Bethlehem in the West Bank for dinner and dancing with our host students! We also went shopping in the Old City where we had to bargain for a good price. Luckily I had Shirley and Qiu Yao who are really good at bargaining since they do it in China! They were awesome and got the price of my stuffed camel down by 20 sheckles. Our host students are really nice. Qiu Yao, Shirley, Monica, and I are staying in an apartment in the building with our host Rachel. It’s been fun to actually stay in a Palestinian home. 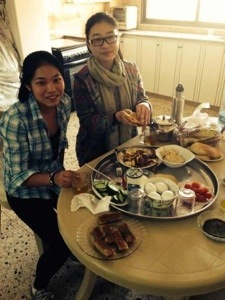 Qiu Yao and I eating a typical breakfast in the apartment this morning! 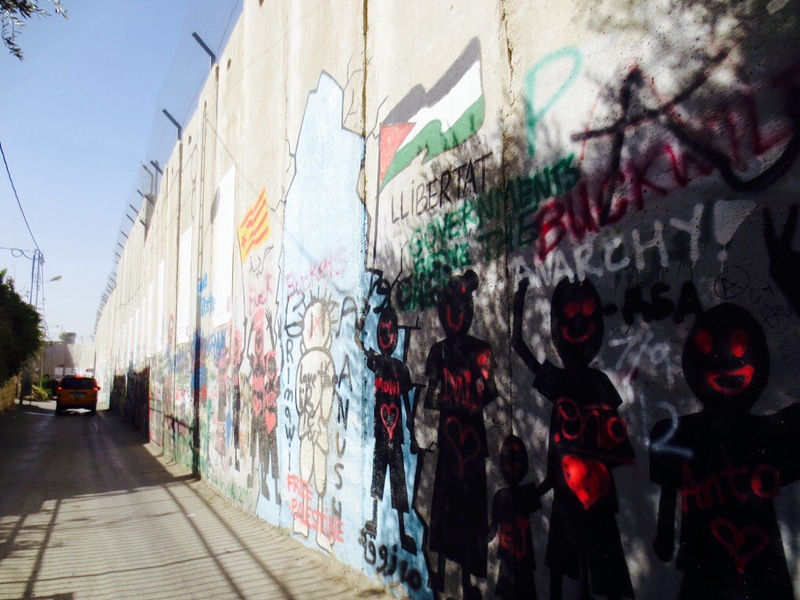 We visited another part of the separation wall this morning where we saw graffiti and messages put up by Palestinians from the area. We then went to hear from a settler in Efrat, a settlement founded in the. 1970s that houses 10,000 modern Orthodox Jews. David, the member who spoke with us grew up in Chicago but moved to Israel to fulfill himself as a Jew. His statements contradict what we have heard from Palestinians. He doesn’t know of any water issue and said that his settlement is “a blessing on the Palestinian community”. He said that the wall was necessary because of how dangerous it was to even just walk around ten years ago. The two hour conversation was very substantive and I really appreciate that he took time to talk to our large group to give his point of view. Contrastly, we then went to a nearby Palestinian farm called The Tent of Nations that is surrounded by five settlements. 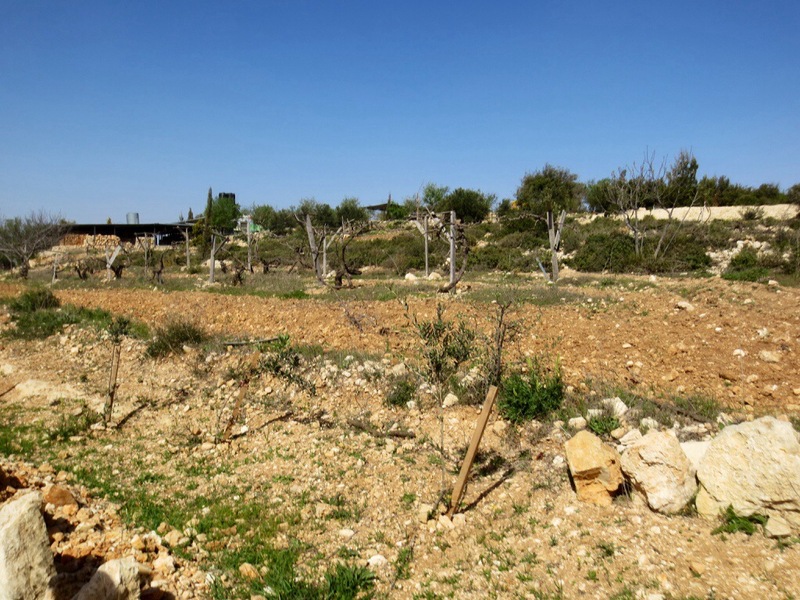 The Israeli government has been persistent in trying to take this land from them. This family, unlike many other Palestinians registered all of the land with the Ottoman Empire to pay taxes and therefore has papers to prove ownership. The government has shut off their water and electricity. There is also a gate and boulders that block the driveway. This government demolished their house and took away building permits so they live in a CAVE. They are self sufficient and have proven that they will do anything to keep this land, even after their trees for harvest have been repetitively cut down. This conflict is so complicated and everyone whom we have spoken with feels passionately for their side. I feel for both sides, because they both feel that they are not being respected. The problem is that there is no trust between the sides and that the people living in both parts do not talk with each other so they just make assumptions about the other based off of the different things that the government is telling them through bias media.